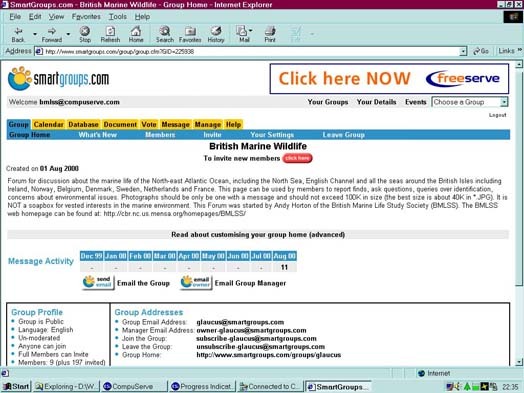 This is the new Yahoo Group replacing the Smart Group which will cease at the end of November 2006. This forum can be used by members to report finds, ask questions, queries over identification, concerns about environmental issues etc. This eForum is participated in by members of many groups studying the marine environment. This discussion group excludes campaigning. Photographs and illustrations are best uploaded to the Photos Section and should not exceed 200K in size (*.jpg). Then you can go to the Marine Wildlife of the North-east Atlantic page and register to join. 3) Choose not to receive EMails, (Web Retrieval Only) which means you can visit the web page to choose what subjects look interesting. These choices can be altered at a later date. Forum for discussion about the marine life of the North-east Atlantic Ocean, including the North Sea, English Channel and all the seas around the British Isles including Ireland, Norway, Belgium, Denmark, Sweden, Netherlands Iceland, Spain, Portugal and France. This page can be used by members to report finds, ask questions, queries over identification, concerns about environmental issues. British Marine Life Study Society. Screen capture of how the page appears once you have registered to join. You will see by the menu at the top of the page, there are far more facilities than just reading messages, like the calendar for including marine life events. Details of the members are open and the amount of message activity is recorded. All eFora take a lot of time to set up (usually 3 months before any appreciable activity begins), so you will not be inundated with messages to start with. If you think that joining will mean too many EMail messages, please use option 3 (on the left) when you join, not to receive any messages. All Group Members have automatic permission to post messages on this unmoderated eforum. To post via the web page, it is necessary to join Smart Groups. In the Document Vault there are useful files explaining how to send messages, i.e. Occasionally, the automatic signing-in process does not work, and you have to sign in using your password.